Gluten-free almond butter cookie | Simply called "Food"
We can’t have peanut butter cookies because of my daughter’s allergy, I decided to make them fully almond. They are also gluten-free, but you don’t even notice. You can also make them vegan by replacing the egg by flax seeds. They are really crunchy and good! It is a great recipe to make to reuse the almond pulp you get when you make almond milk. In a small bowl to combine the flax seeds and the water. In a bowl, mix the almond flour or pulp, the rice flour, the baking soda and the salt. In another bowl, cream the coconut oil and the sugar. Add the flax seeds mix and the vanilla. Gradually add the dry ingredients to the coconut oil mix. Put in the chocolate chips and the quinoa puffs. Take 2 tbsp. 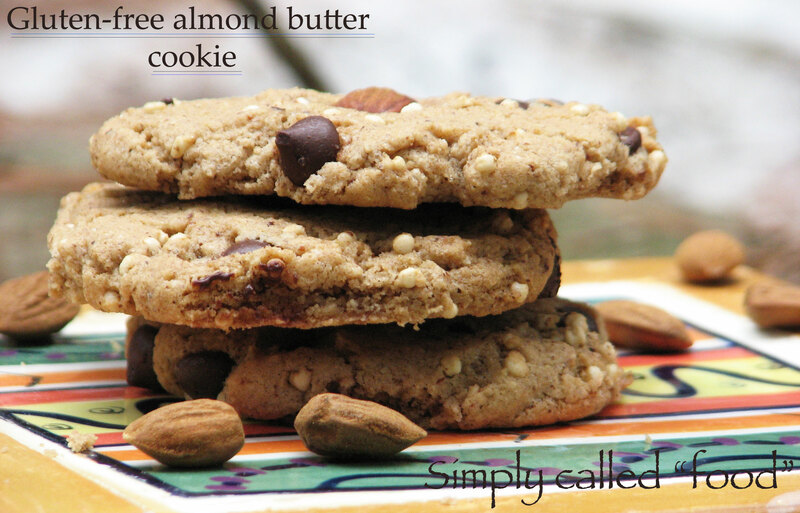 (30ml) of batter and put it on a cookie sheet and decorate with whole almonds. Cook for 15 minutes. When ready, place them on a wire rack to cool. Tags: Almond meal, Cookie, dessert, Food, Gluten free, healthy recipe, Nuts, Quinoa, Recipe, Snacks, Vegan, Vegetarian. Bookmark the permalink. Pingback: Day 10/15: Saturday Cheat Day | the misadventures of a cooking monster.. om nom!